Grand Rapids Starbucks Union and the Seville local of the Spanish CNT have announced a Global Day of Action against Starbucks July 5th. The Union of Comerical and Hotel workers CNT-AIT in Sevilla, Spain along with the Grand Rapids Starbucks Workers Union (IWW) have announced a Global Day of Action scheduled for July 5th. The two groups are asking social organizations, unions, and individuals from around the world to promote and participate in this day of action. On April 24th, 2008 a barista named Monica was fired for her union activity from a Starbucks in Sevilla, Spain. She was a member of the Union of Commercial and Hotel Workers of the Confederacion Nacional de Trabajadores (CNT). Now with the support of all CNT affiliates, the International Workers Association, and the Starbucks Workers Union (IWW) they are demanding justice for Monica. The treatment of Monica in Spain by Starbucks is similar to the charges of anti-union discrimination being investigated by the National Labor Relations Board in Grand Rapids, Michigan. This new Grand Rapids investigation comes less than a year since Starbucks signed a settlement agreement with the NLRB claiming they would end intimidation against baristas interested in joining the Starbucks Union. 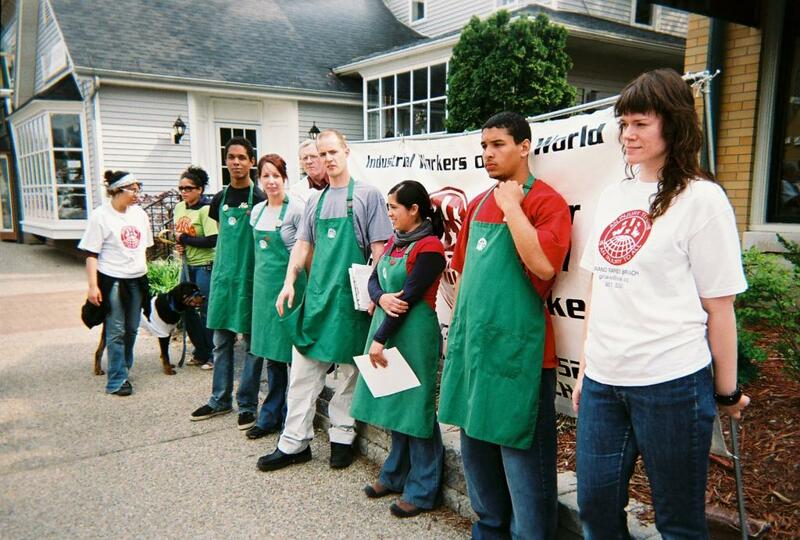 The Grand Rapids Starbucks Workers Union (IWW) calls on everyone interested in social justice and worker's rights to confront global coffee giant Starbucks on July 5th with international solidarity. For Monica in Spain, for baristas in Grand Rapids, and for coffee farmers around the globe. Grand Rapids firing comes in the midst of Unfair Labor Practice charges being investigated by the NLRB against Starbucks. Grand Rapids, MI (06/06/2008)- Starbucks terminated a barista active in the IWW Starbucks Workers Union today as part of its ongoing effort to combat a growing movement of employees pushing for a living wage and secure work hours. The barista, Cole Dorsey, was fired after two years of service while he was coordinating a union recruitment drive at Starbucks stores in Grand Rapids. Starbucks' pretext for the illegal anti-union firing was that Dorsey was guilty of some months-old attendance infractions. "Today I joined the growing number of baristas that Starbucks has fired in its relentless union-busting campaign," said Cole Dorsey. "Starbucks' disrespect for the right to join a union is appalling and absolutely will not stop our efforts to have a voice at work." The firing comes as a National Labor Relations Board judge is set to rule after a lengthy trial on the retaliatory terminations of three New York City baristas. Even before the firing, the NLRB was investigating whether Starbucks violated a settlement agreement entered into in Grand Rapids over anti-union discrimination. In 2006, Starbucks was forced to re hire two union baristas who had been unlawfully fired for union activity. This latest firing in Grand Rapids signals that reinstalled CEO Howard Schultz will not modify the company's practice of terminating outspoken union baristas to intimidate workers from joining up. This firing in Grand Rapids is the same tactic Starbucks employed against a union member in Sevilla, Spain. On April 24, Monica was fired from a Starbucks in Sevilla for her activity on behalf of the Confederacion Nacional de Trabajadores (CNT). In response the CNT in Sevilla, along with the Starbucks Union in Grand Rapids, have announced a Global Day of Action set for July 5. Workers, students, and concerned citizens around the world will be confronting the global coffee giant on that day demanding an end to Starbucks union-busting policies. DEMAND STARBUCKS REINSTATE COLE DORSEY IN GRAND RAPIDS! PARTICIPATE IN THE JULY 5TH GLOBAL DAY OF ACTION! SolFed will be picketing Starbucks on July 5th in (at least) London, Brighton and Manchester calling for the reinstatement of Cole and Monica. We invite you to join us if you're around. The London one will be at the New Oxford St branch, Tottenham Court Rd tube, at 1pm. FAU Unions will be picketing Starbucks on July 5th in Germany in around eight citys. Organise! and the Belfast branch of the WSM will be picketing Stabucks on Botanic Avenue and in Cornmarket in Belfast on Saturday 5th from noon.